Manfrotto Rail - Black - 13' 3"
Place your order by 7 AM ET Monday through Friday and your order will ship the same day. 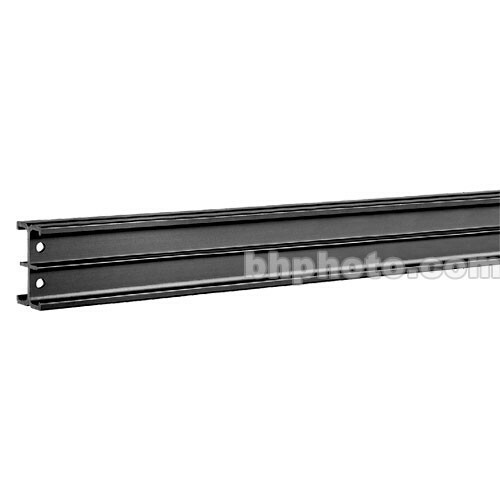 This rail is made in sections of black anodized aluminum 13' 3" (4 M). For fixed rails, longer sizes are obtainable by fitting two or more rails together. Sliding rails cannot be joined. To connect two fixed rails use code FF3208. You must always support the junction of two rails with a ceiling attachment placed on the junction itself. Moving rails longer than 118" must be supported with more than two fixed rails. The maximum distance between any of these fixed rails is 78.7". Box Dimensions (LxWxH) 158.0 x 4.0 x 4.0"
Does the Manfrotto Rail come in plain alumminum color?